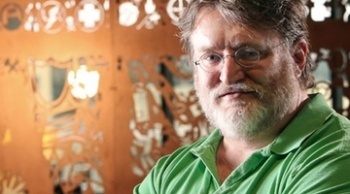 Valve's CEO will soon be rewarded with the Academy's "highest accolade" for his contributions to the gaming industry. Gabe Newell, CEO of Valve Corporation, has certainly done his part influencing the way we interact with games, from encouraging mod support to the rise of Steam as a major PC gaming platform. The British Academy of Film and Television Arts (BAFTA) seems to think so too, and the Academy is awarding Newell with a BAFTA Fellowship at the upcoming British Academy Games Awards. In light of his achievements over a 30 year career, Gabe will soon be joining other Academy Fellows including Peter Molyneux, Shigeru Miyamoto, and Will Wright. BAFTA says the Fellowship is "the highest accolade bestowed upon an individual in recognition of an outstanding and exceptional contribution to games". He'll receive the award at the official ceremony on 5th March. In response to the announcement, Gabe said: "It is an honor for myself and everyone at Valve to be presented such an award by one of the world's most respected and recognized organizations. "Valve owes a tremendous thanks to many in the UK - to those who have played our games, to the great support of the UK press, and to UK-based creative contributors such as Garry Newman. I look forward to accepting this prestigious honor on behalf of everyone in our community." Harvey Elliott, Chair of BAFTA's Games Committee, praised Gabe's "unique" contribution to the gaming industry. "As well as enjoying great critical and commercial success with phenomenally popular franchises such as Portal and Half-Life, his work in giving back to the games industry through developing and showcasing other games makers has been outstanding. He is an inspirational developer and truly deserving of our Fellow recognition." This isn't the first BAFTA for Valve; the company was awarded "Best Multiplayer" with Left 4 Dead and Left 4 Dead 2, and "Best Game, Story, and Design" for Portal 2.